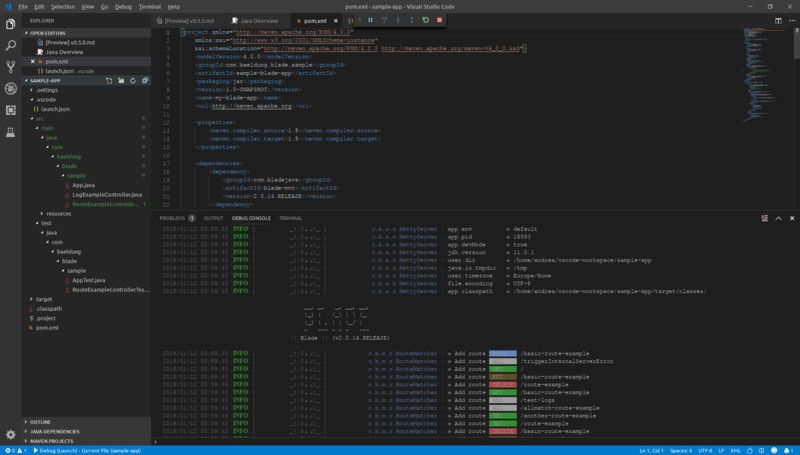 Blade is a tiny Java 8+ MVC framework, built from scratch with some clear goals in mind: to be self-contained, productive, elegant, intuitive, and super fast. Many different frameworks inspired its design: Node’s Express, Python’s Flask, and Golang’s Macaron / Martini. Blade is also part of an ambitiously larger project, Let’s Blade. It includes a heterogeneous collection of other small libraries, from Captcha generation to JSON conversion, from templating to a simple database connection. However, in this tutorial, we’ll focus on the MVC only. Since our app will be created as a JAR, it won’t have a /lib folder, like in a WAR. As a result, this leads us to the problem how to provide the blade-mvc JAR, along with any other JAR we might need, to our app. The different ways of doing this, each one with pros and cons, are explained in the How to Create an Executable JAR with Maven tutorial. For simplicity, we’ll use the Maven Assembly Plugin technique, which explodes any JAR imported in the pom.xml and subsequently bundles all the classes together in a single uber-JAR. After that, the application will be accessible at the http://localhost:9000 URL. We’ll explore the above functions in the next sections. In short, routing in MVC is the mechanism used to create a binding between an URL and a Controller. Blade provides two types of routes: a basic one and an annotated one. The name of the method used to register a route corresponds to the HTTP verb that will be used to forward the request. As simple as that. In this case, we’re returning a text, but we can also render pages, as we’ll see later in this tutorial. Certainly, for more realistic use cases we can define all the routes we need using annotations. We should use separate classes for that. First of all, we need to create a Controller through the @Path annotation, which will be scanned by Blade during the startup. On the other hand, if we don’t put any method parameter, the route will intercept every HTTP call to that URL, no matter the verb. There are several ways to pass parameters to our routes. Let’s explore them with some examples from the documentation. Blade can also serve static resources if needed, by simply putting them inside the /resources/static folder. For example, the src/main/resources/static/app.css will be available at http://localhost:9000/static/app.css. We can now open the http://localhost:9000/custom-static/ to show the content of the folder. As seen in the Introduction to WebJars tutorial, static resources packaged as JAR are also a viable option. Blade exposes them automatically under the /webjars/ path. Since Blade is not based on the Servlet Specification, objects like its interface Request and its class HttpRequest are slightly different than the ones we’re used to. Obviously, the same method is available for Long and String types too. The API for reading and writing objects in a Request and a Session are crystal clear. An interesting feature is their Generic return type <T> T, which saves us from the need of casting the result. We can easily send a simple output to the caller through one of the handy output methods, along with a 200 HTTP code and the appropriate Content-Type. The first parameter sets the name of the file that will be downloaded, while the second one (a File object, here constructed with a String) represents the path to the actual file on the server. The templates default directory is src/main/resources/templates/, hence the previous one-liner will look for the file src/main/resources/templates/admin/users.html. We’ll learn more about this later, in the Templating section. A redirection means sending a 302 HTTP code to the browser, along with an URL to follow with a second GET. Finally, the Response object provides us with several other methods to perform operations like writing Headers, setting the Content-Type, setting the Status code, and so on. 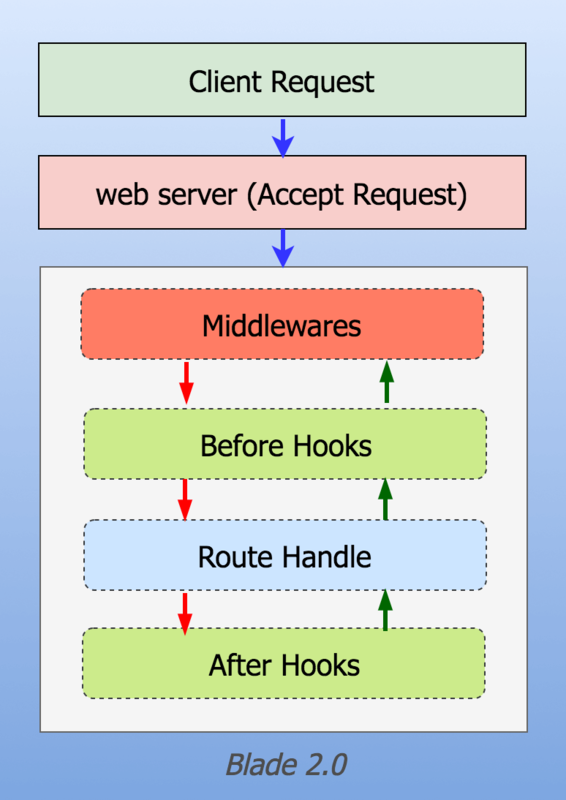 A WebHook is an interceptor through which we can run code before and after the execution of a routing method. As we can see, after() is a default method, hence we’ll override it only when needed. The @Bean annotation tells the framework to scan the class with the IoC Container. In Blade, the configuration is totally optional, because everything works out-of-the-box by convention. However, we can customize the default settings, and introduce new attributes, inside the src/main/resources/application.properties file. We can read the configuration in different ways, with or without specifying a default value in case the setting is not available. The several settings already configured, but ready to be customized, are grouped by type and listed at this address in three-column tables (name, description, default value). We can also refer to the translated page, paying attention to the fact that the translation erroneously capitalizes the settings’ names. The real settings are fully lowercase. When deploying our app to a different environment, we might need to specify different settings, for example the ones related to the database connection. Instead of manually replacing the application.properties file, Blade offers us a way to configure the app for different environments. We can simply keep application.properties with all the development settings, and then create other files in the same folder, like application-prod.properties, containing only the settings that differ. Templating in Blade is a modular aspect. While it integrates a very basic template engine, for any professional use of the Views we should rely on an external template engine. We can then choose an engine from the ones available in the blade-template-engines repository on GitHub, which are FreeMarker, Jetbrick, Pebble, and Velocity, or even creating a wrapper to import another template we like. Blade’s author suggests Jetbrick, another smart Chinese project. As a result, now every file under src/main/resources/templates/ will be parsed with the new engine, whose syntax is beyond the scope of this tutorial. For this purpose, we can take a look at the code of the actual Jetbrick wrapper to get an idea of what that means. 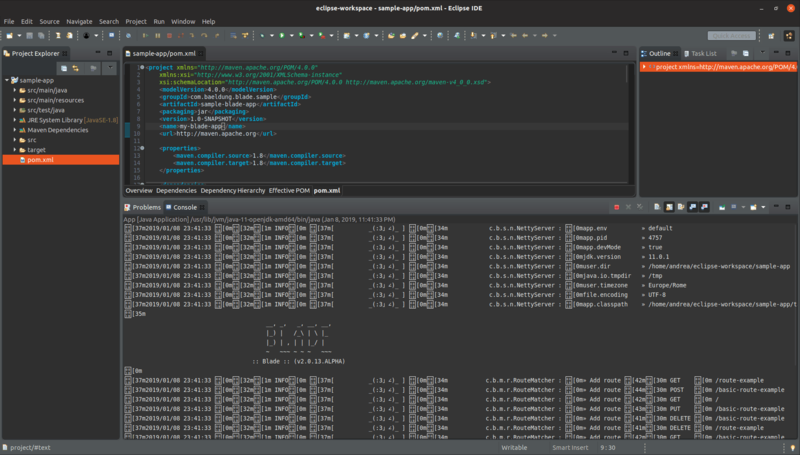 Blade uses slf4j-api as logging interface. An Exception Handler is also built-in by default in the framework. It prints the exception to the console, and if app.devMode is true, the stack trace is also visible on the webpage. Similarly, the errors 404 – Not Found and 500 – Internal Server Error are handled through skinny default pages. Certainly, those HTML pages must be placed under the src/main/resources/templates folder. Another interesting feature of the framework is the possibility of scheduling the execution of a method. Indeed, it uses the classical cron expressions to specify the DateTime coordinates. We can read more about those in A Guide to Cron Expressions. Later on, we might exploit the static methods of the TaskManager class to perform operations on the scheduled tasks. As already seen in section 9.1, it’s possible to listen for a specified event before running some custom code. While the first six are easy to guess, the last two need some hints: ENVIRONMENT_CHANGED allows us to perform an action if a configuration file changes when the server is up. SOURCE_CHANGED, instead, is not yet implemented and is there for future use only. Talking about the session, its default implementation stores session values in-memory. We might, thus, want to switch to a different implementation to provide cache, persistence, or something else. Let’s take Redis, for example. We’d first need to create our RedisSession wrapper by implementing the Session interface, as shown in the docs for the HttpSession. When running Blade from the command line, there are three settings we can specify to alter its behavior. 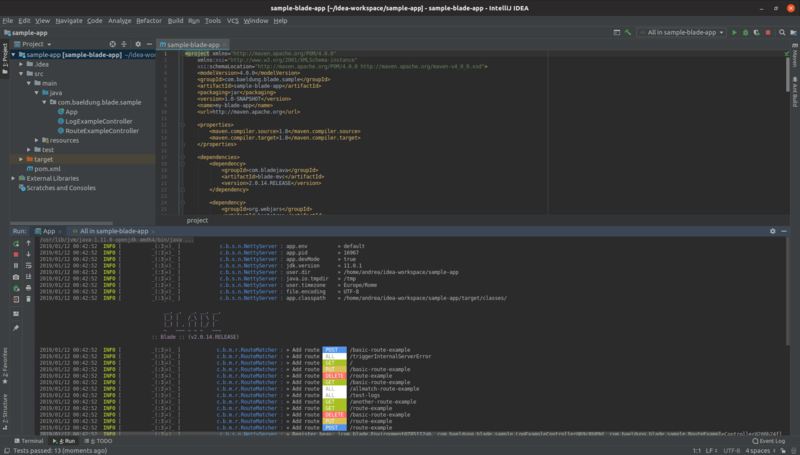 Any modern Java IDE is able to play a Blade project without even needing the Maven plugins. 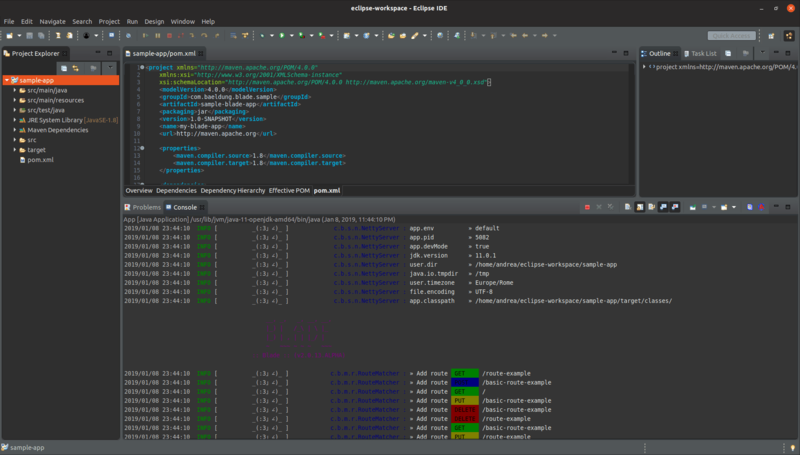 Running Blade in an IDE is especially useful when running the Blade Demos, examples written expressly to showcase the framework’s functionalities. They all inherit a parent pom, so it’s easier to let the IDE do the work, instead of manually tweaking them to be run as standalone apps. In Eclipse, it’s enough to right-click on the project and launch Run as Java Application, select our App class, and press OK.
It’s also possible to use VSCode, a popular non-Java-centric IDE, by previously installing the Java Extension Pack. We’ve seen how to use Blade to create a small MVC application. The entire documentation is available only in the Chinese language. Despite being widespread mainly in China, thanks to its Chinese origins, the author has recently translated the API and documented the core functionalities of the project in English on GitHub. As always, we can find the source code of the example over on GitHub. Can we compare it with spring mvc or spring web flux or some thing similar one??? Is there any pros or cons of it over others??? Any comparision or performance benchmarks?? ?